A special thank you to Edelweiss and Simon & Schuster for an ARC in exchange for an honest review. 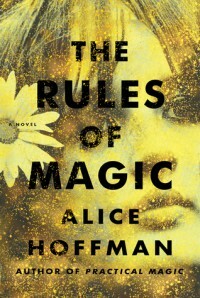 Hoffman revisits the Owens family in this prequel to Practical Magic. For hundreds of years, the Owens women have been blamed for everything that has gone wrong in their Massachusetts town. It all started in 1620 when Maria Owens was charged with witchery for falling in love with the wrong man. Hundreds of years later in New York City, Susanna Owens knows all too well the dangers of falling in love, and tries to spare her three children from the curse. This means no walking in the moonlight, no red shoes, no wearing black, no books about magic, and most importantly, no falling in love! Franny, her most difficult child, has hair the colour of blood, and skin as white as milk; Jet is a dark-haired shy beauty who can read other people's thoughts; and Vincent, irresistible to women, is full of trouble. The Owens children visit their Aunt Isabelle at her home in Massachusetts where they uncover family secrets, and the truth of who they really are. Feared and revered, it is made clear that this next generation of Owens will not be exempt from the scorn of the townspeople, that is until they want something that only magic can cure. Back in New York City, each of the Owens children begins on their own journey of discovery while trying to avoid the family curse by not falling in love. They cannot escape the magic, just as they cannot escape love and the bonds they share. Thrilling and magical, this beautiful work sets the table—the sisters grow up to be the aunts from Practical Magic, while Vincent leaves behind the legacy that will define the Owens women. Rich with imagery and prose, Hoffman sprinkles pop-culture and history in this beautiful story of love, loss, and magic, and I simply did not want it to end.